I'm amazed by the number of books have come to my notice in recent times about imaginary friends. It's as if the idea of writing about them has been buzzing around the ether for a very long time, then suddenly bitten many authors at the same time. The intriguing thing is that there are many common ideas about the nature of imaginary friends. They can change form and move from one person to another; there's a kind of 'holding zone' where they go when they don't have someone to imagine them. Some are better than others of course, one of my favourite novels was The Imaginary by AF Harrold & marvellous illustrator Emily Gravett. Then there's the superb picture book Beekle the Unimaginary Friend by Dan Santat which won the Caldecott Medal in 2015. Confessions of an Imaginary Friend took me in with its lovely beginning. 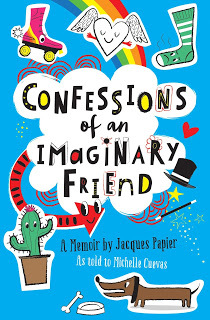 Jacques and his twin sister Fleur have a marvellous time together, parents never interfering in their games, doing well at school etc, until Jacques meets a roller-skating cowgirl in the park and discovers the truth... he doesn't really exist - he's Fleur's imaginary friend. Her parents have gone along with Fleur's conviction that Jacques is part of their lives, to the extent of setting him a place for dinner and buying him a ticket when they go out somewhere, but finally a trip to the psychiatrist is called for, where Jacques meets an odd assortment of other imaginary friends who invite him to Imaginaries Anonymous meetings. He decides he wants to be real so asks Fleur to set him free - but freedom's not really possible, he only exists when he is someone's friend... quite a lot to think about here. He goes through a number of incarnations, some for rather unpleasant children who are eventually improved by his being in their life, until again he's not required. I loved all the different games the children played, the way everything seems possible when you are young, until the inevitability of growing up happens. There are many challenges to be overcome and clever ideas explored, as we whisk from one incarnation to another. Jacques is lucky to hang on to his name and there's a nice circular conclusion to the story.